Bering Sea crabbers were stunned last week when outlooks for the upcoming fall and winter fisheries were revealed. "I don't think anybody was expecting the numbers to be as low as they ended up. That was a shock," said Ruth Christiansen, science adviser and policy analyst for the trade group Alaska Bering Sea Crabbers. "I'm not worried about that one not opening. But given the information we have and the state's tendency to always be cautious, the catch will be lower than the 40.6 million pounds from last year," Christiansen said. The harvest strategy for bairdi Tanner crab is based on a threshold of mature females. Not enough females means no fishery, and the survey showed a drop of nearly 60 percent from just a year ago. The crabbers believe the bairdi are still out there — just moved to a different spot. "It's not one of those things where we don't think the crab is there, it's a result of the survey not being able to find them," Christiansen said. Bairdi catches have been on a steady climb since 2013, approaching 20 million pounds last season, and the fleet has logged good catches. Crabbers believe the cause of the disappearing crab is changing ocean conditions, pointing out that 2016 is one of the hottest years on record for Bering Sea water temperatures, both at the sea surface and on the ocean floor, something federal scientists have confirmed. "We've seen dramatic drops in crab numbers from last year to this year. It's not an overfishing issue or fishing mortality or natural mortality. Something else is going on," Christiansen said. The red king crab outlook for Bristol Bay is a bit brighter. Managers use a different balancing act there to set catch quotas. "The state bases its strategy on the spawning biomass, which is a combination of the males and females, and even though one went up and one went down, the balance is the same. So we are not anticipating that catch to change dramatically," she explained. Crab scientists are now crunching the data and will present more complete findings later this month. Bering Sea crab quotas will be released early next month with the fisheries opening Oct. 15. Unlike most other Alaska regions, Yukon River salmon fishermen are enjoying some record salmon catches. The combined fall chum and coho harvest of more than 1 million fish is the largest in the 55 years of the commercial fishery, according to regional managers. "It's a pivotal year," said Jack Schultheis, longtime manager of Kwik-Pak Fisheries in Emmonak. "There's never been a pink fishery in the river before and this was the first year we targeted them," Schultheis told Seafood.com "The catch of 127,250 may not sound like much, but considering no one has ever bought pinks on the Yukon, we're encouraged about that." Schultheis credited the good returns to "excellent management." "The department (of Fish and Game) has done an exceptional job managing the fishery," he said. "That's why I feel very positive about the future. I think this is going to be the norm, to have consistent runs like this." "Wild Taste, Amazing Place" is the theme of an ambitious Bristol Bay red salmon branding program that launched this month in Boulder, Colorado. 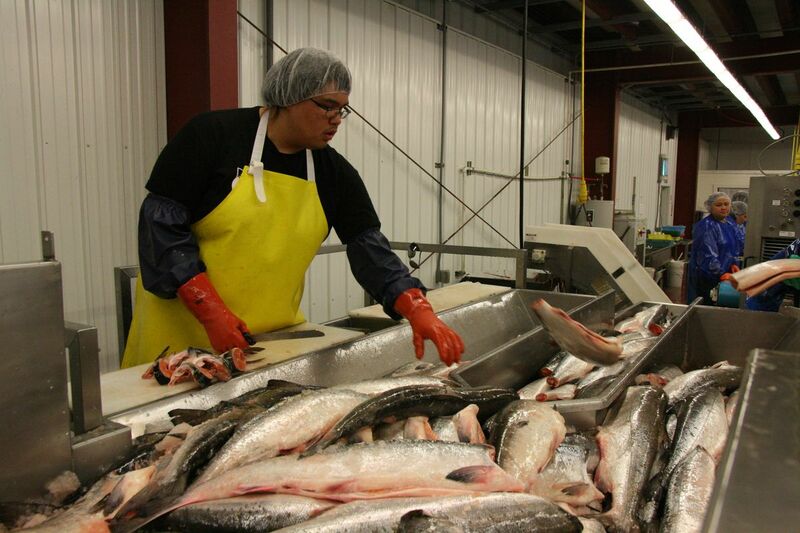 "We've been working for months with just about every level of the supply chain from processors to distributors and retailers to help them get Bristol Bay sockeye into their stores," said Becky Martello, executive director of the Bristol Bay Regional Seafood Development Association. The association is bankrolling the $700,000 pilot program with a 1 percent tax paid by member driftnet fishermen on the dockside value of their catch. The fishermen have partnered with Anchorage-based Rising Tide Communications whose creative experts have long been involved in Alaska fishing. The campaign includes training retailers about the special features of Bristol Bay, recipes, posters, special dinners by local chefs, mugs — even branded wrapping paper for the bright red sockeye fillets. "When people buy the salmon it is wrapped up in beautiful craft paper and sealed with a Bristol Bay sticker," Martello said. Fishermen will be on hand throughout the four-month promotion as a tie-in to their new website's Know your Fisherman section. "That is huge with consumers and with our millennial target," she said. "They really want to know where their food comes from and connecting them to the fishermen is the most natural way to tell that story and connect people to Bristol Bay." The Wild Taste, Amazing Place promotion will run through the end of the year and be evaluated by an independent firm. "We are investing a lot of our fishermen's dollars in this and we want to make sure we are on the right track," Martello said, adding the response to the effort has been overwhelmingly positive. "We've had so much great feedback," she said. "It's so gratifying to see how many people are getting onboard with it. It's really exciting." See the snazzy website at bristolbaysockeye.org/.